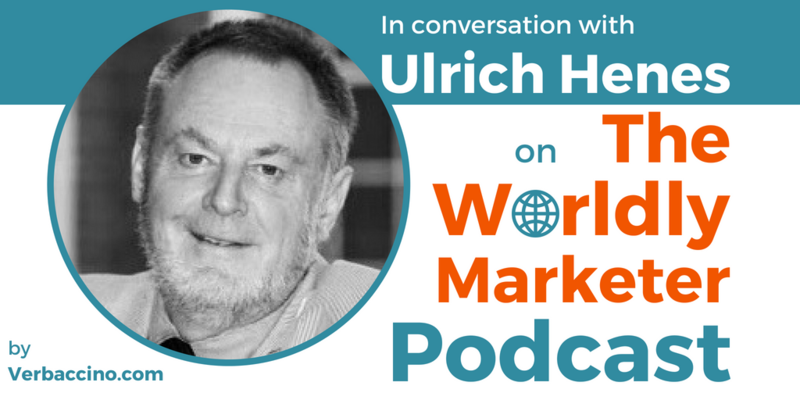 Ulrich Henes is the Founder & President of The Localization Institute, and was previously featured on episode #49 of The Worldly Marketer Podcast. Since 1995, the Institute has become a leader in educational advancement in the field of localization. It has partnered with top universities and professional associations to develop comprehensive certification programs in localization project management, quality management, and global digital marketing. In 2003, Ulrich co-founded the Localization World conference series, which is now held three times a year – in North America, in Europe, and in Asia – and is recognized as the world’s premier conference and exhibition series for the localization industry. Currently, he’s busy preparing for the 38th edition of LocWorld, which will take place in Seattle, Washington, this October. Ulrich is passionate about connecting the localization and global marketing communities. And that’s why, in 2013, he also launched the Brand2Global conference series, which is specifically designed for professionals who drive global marketing and are responsible for international market share and revenue. I had the great honour of being invited to be a panelist at the last edition of Brand2Global, which was held in Silicon Valley last Fall. In this epsisode, Ulrich talks about the next edition of Brand2Global, which is being planned for Spring of 2019. More specifically, we chat about a very exciting project that we’ll be working on together in advance of that conference: the B2G Podcast, to be launched in the Fall of 2018.